All of our Chesterfield Sofas are handmade to order by Timeless Sofas in our factory shop. All of our sewing is hand-sewn by our in-house seamstresses. Our range of Chesterfield Sofas can be created in standard antique style leathers or we can source premium full grain distressed leathers for a true traditional Chesterfield look. We also offer a modern take on the classic Chesterfield Sofa designs which can definitely suit the contemporary style of living. Using our range of stylish fabrics in wide-variety of colour choices, you can carefully choose and match your furniture to homely surroundings. Our traditional and trusted techniques are to construct around our robust hardwood frames which are all screwed and dowelled for added stability, every single piece is subject to the highest levels of scrutiny for excellence of craftsmanship, durability and care. 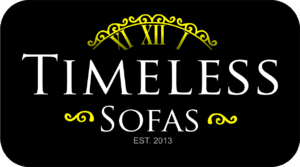 Nothing at Timeless Sofas is mass produced, every product we manufacture is carefully hand-made to order. We currently offer a range of standard sizes: Chair, 2 Seat, 3 Seat & 4 Seat Sofas. We can additionally provide a bespoke Chesterfield service where we can create and build to meet any specific size or dimension you require, this applies to both leather and fabric variants. Typically our Chesterfield range is manufactured with seat cushions, we can additionally offer a deep button seat base as an alternate, or as deluxe premium you can have a deep button seat base and a set of seat cushions. Upon purchasing one of our pieces of furniture you will receive a 10-year structural guarantee. Come and visit our new showroom in bury! Shop with us and try out a few of our Luxury range of quality luxury Furniture including leather and fabric timeless chesterfied sofas. deep buttoned and tufted chesterfield sofas & Chesterfield chairs handmade in the heart of England. Call us on:- 0161 870 9150 for more information.